and sometimes even a lot more which Eric and I described in our gold book. Like us on Facebook and follow us on Gem Hunter and learn more about gemstones and gold. For those of us who are mechanically declined, gold pans are great: no buttons, meters, scales, batteries or electronics. They provide a break from today’s ubiquitous computers and electronics that frankly get on my nerves. Ever go out to dinner just to see all of the people around you texting on their phones and ignoring their company. Yes, I would just like to grab a few of those people by the earlobes and take them out in the field to pan for gold. During the 1849er gold rush in California, more than 118 million ounces of gold were found by gold prospectors. 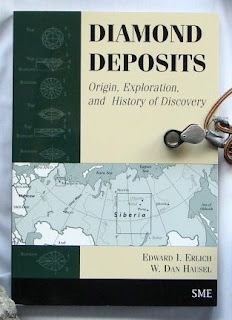 Many of these discoveries began with prospectors simply using tin plates. When they found gold in their pans, they starting looking up slope for lodes filled with gold. Those who used diligent prospecting methods often found the source of the gold. In those days, panning had two purposes: to search for gold and to clean a dinner plate. minerals that erode from diamond pipes. So did the 49ers find all of the gold? Nope, they only found the easy lodes. Remember, a lot of their gold came from placers and placers eroded from nearby lodes. It is likely the prospectors depleted many of the better placers, but they barely scratched the surface of the lodes! After searching for gold in Wyoming, it is apparent hundreds of gold deposits have been overlooked not only in Wyoming, but all over the US. 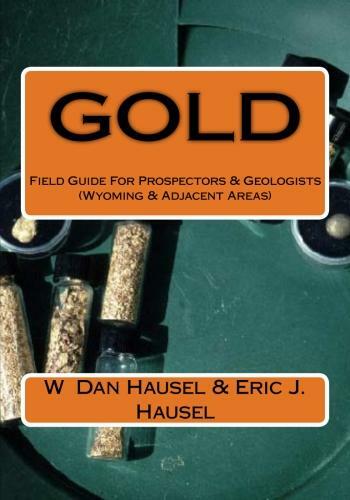 We found gold all over southern Wyoming not only adjacent to Interstate-80, but even in the Laramie City landfill – all places no one had ever thought to look! Today, the “Golden State”, home of the “Forty-niners”, divorced its heritage and chose bankruptcy over mining. Not a bright thing to do, but California’s politicians have never been accused of being smart. Not only that, California no longer allows people to use hobby dredges to dig for gold, even though the state was built on gold mining. Hobby dredges are essentially harmless, but Uncle Al and his followers find if anyone makes money besides them, then this is wrong. 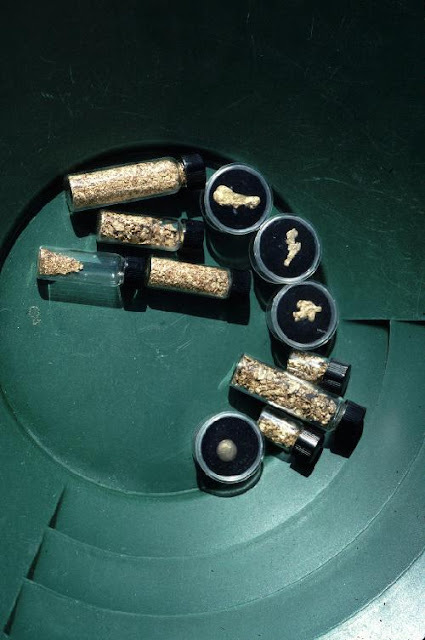 More than 118,000,000 ounces of gold and 600 diamonds were recovered in the past! At today’s price, all of that metal would be worth more than $200 billion! Enough to pay off some IOUs. Even though all of that metal was mined in the past, as an exploration geologist, I know where there once was gold, there still is gold hidden near the surface, along trends, and even within the old mines. Usually many times the amount of gold mined in the past. And where did those diamonds come from? No one has yet found the source of the diamonds accidentally discovered by old gold miners. In the 19th century (as today) few prospectors had knowledge of what diamonds looked like, particularly since the great diamond rush in Kimberley South Africa, didn’t take place until 1871, twenty-two years after the great Californian gold rush. And it is likely thousands of diamonds were mined with the Californian gold and were rejected with quartz in the mine tailings, simply because the prospectors had no idea what the diamonds were. The diamonds from California ranged from less than a carat to one that weighed 32.99 carats (Hausel, 1998; Erlich and Hausel, 2002). It is important to keep diamonds in mind while prospecting for gold, because some are worth thousands of times more than an equivalent weight of gold (after faceting). And many collectors pay premium prices for raw natural diamonds from unique locations. While panning for gold, one often sees curious bystanders. Photo by my beautiful daughter - Jessica. 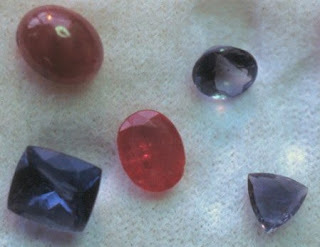 These are not the only gemstones that have been found in California or elsewhere in North America. A few years ago, while searching for diamonds in California, I recovered several beautiful light-blue benitoite gemstones from panned concentrates taken in the Sierra Nevada Mountains. Benitoite looks very similar to sapphire. Further north in California, I also recovered pyrope garnet and chromian diopside. In Wyoming, we recovered gold from many areas where gold had not been reported. But we also found gold right in the middle of areas where people had mined gold in historical past. In addition to precious metals, we found gem-quality garnet, chromian diopside, ruby and sapphire in streams, and a few placer diamonds were also found in streams by others. Some of these gemstones were even recovered from ant hills along with peridot gemstones. So there is still much to be found, even with a gold pan. When I was a geologist working in Wyoming, I visited hobby dredgers in the Douglas Creek district in the Medicine Bow Mountains to see what they were finding in their black sands. While observing the dredgers, I noticed the trout played with their suction hoses as they kicked up sand, mud, and nutrients: if you want to see a school of fish, you will always find them around these hobby dredges. And it doesn’t take a genius to realize that when it rains, or during periodic flash floods, or during spring runoff from snow melt, Mother Nature dumps more dirt and mud into the creek than a million hobby dredgers could ever. Even so, prospectors are always blamed for environmental damage from naive regulators whether real or imagined. I found that nearly every regulator in Wyoming was either a member of an environmentalist group antipathetic to mining and the American way of life, or already had their minds made up. 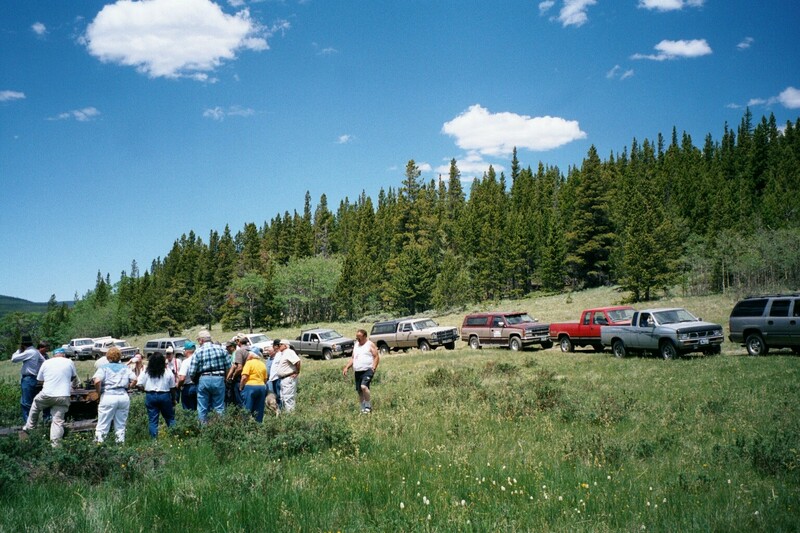 One of the worse bastions of radical environmentalists was in the forest service. Why are all of these people so dead set against others enjoying their lives and making a little money? it originated. Also keep in mind, if you are panning for diamonds, look for heavy minerals including garnets. mica, you likely will not be concentrating garnets nor diamonds. 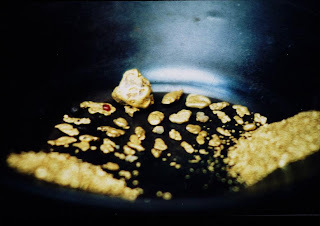 At one location on Douglas Creek, a prospector displayed gold in a pan. The gold was nice, but my eye was drawn to a small, rounded pyrope garnet. 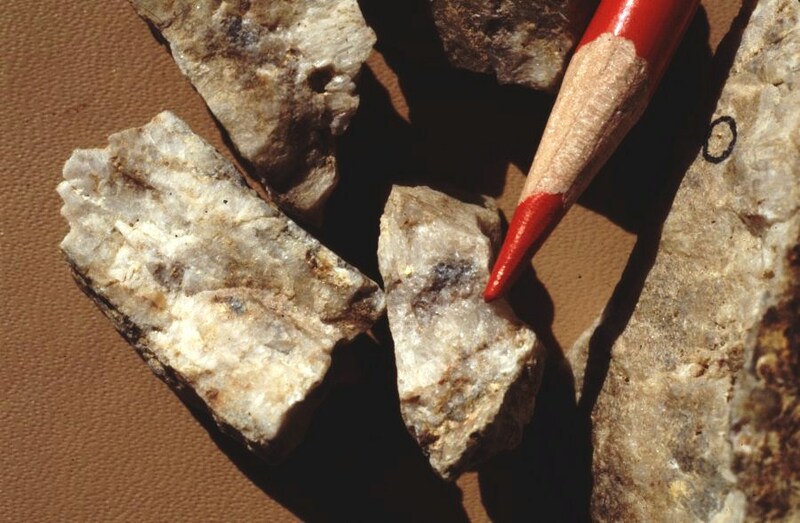 Diamond prospectors use pyrope as a guide to diamond deposits, since most erode from kimberlite pipes. My field assistant and I had identified some cryptovolcanic structures upstream from this find on Douglas Creek and we wondered if these were unusual structures were the source of the pyrope garnets. Cryptovolcanic structures are circular structures with distinct vegetation anomalies similar to many known diamond deposits in the region. Further upstream, a prospector had recovered two gem-quality diamonds with gold in a long-tom built in the side of Cortez Creek. The source of these diamonds has never been identified. 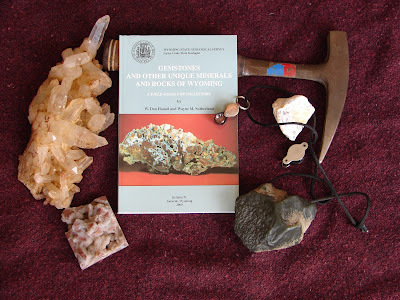 At another location in the Medicine Bow Mountains in the Middle Fork of the Laramie River near the town of Centennial, people on one of my geology field trips recovered dozens of pyrope garnets in gold pans as they learned to pan: no gold – just a lot of diamond indicator minerals! kimberlite pipe found in the Colorado-Wyoming State line district. I never thought I would see the day, but there has been talk of banning gold panning in California. After years of panning for diamond indicator minerals in streams in search of diamond deposits, the only damage I can even imagine one might accomplish with a gold pan is develop stiff knees and lower back pains a trip to a chiropractor. Banning hobby dredging is bad enough, but is more like banning Tonka Toys to keep kids from digging holes in sand piles. Even so, you will never get rich with a pan. A gold pan is simply a tool to assist in finding the ‘Mother Lode’. The more popular pans are space age plastic pans that you can buy at most sporting goods stores. These are a easier to use than the old tin pans, and the darker ones are good for high-lighting gold. When you start panning, get comfortable. You might take off your shoes and socks, put your feet in the water, or wear water proof boots as you pan, but find somewhere you can sit down. To speed up the processing, a small shovel is useful to dig mud and dirt from the stream or bank. Stream banks should not be ignored because they were deposited by the stream – and if gold occurs in the creek, it will also be found in the bank. It is not necessary to use anything other than a gold pan, but I found using a sieve speeds up the processing. When you buy a gold pan, also buy a Grizzly pan (also referred to as a classifier) to place on top of your pan. If you are in bear country, remember there are two kinds of grizzlies (a sieve and the kind that will eat you). In Alaska (and other localities in the West), not only can bears be a problem but mosquitoes have been rumored to periodically take down moose. So be prepared for weather and the creatures you might encounter, particularly when you will be distracted by panning. Panning is simple and obeys the laws of physics and fluid dynamics. The specific gravity of pure gold is 19.3 or 19.3 times as heavy as an equal volume of water; thus it is notably heavy and will stay in the gold pan as you wash out other minerals. Many black sand minerals have specific gravities that range from 3 to 6. One of the more common minerals in your black sand is magnetite which has a specific gravity of 5.2. Because of this, it is also helpful to have a strong magnet that you can cover with a paper towel or some other material, to run through the black sand concentrates in your gold pan, especially if you are looking for gemstones. This is unnecessary for gold because the gold will be very obvious once you find it. You can learn more about various minerals from a variety of mineral identification guidebooks. The lighter-colored material with lower specific gravity in your gold pan consists mostly of quartz, feldspar and mica. Quartz has a specific gravity of 2.6 to 2.7; feldspar 2.55 to 2.72 and mica 2.7 to 2.9. So these light-colored minerals should wash out of a pan fairly easily. Another white mineral that is periodically encountered is scheelite. It has a high specific gravity (5.9 to 6.1) and drives prospectors crazy who often think it is ‘heavy quartz’ that they cannot pan out without losing all of the black sands. So, if you have a lot of so-called heavy quartz, you might check to see if you are near any old tungsten mines – scheelite is a calcium tungstate and will glow light-blue under short wave ultraviolet light (Hausel, 2006, 2009). When permeated with water, gravel and soil will tend to behave like a liquid. Stirring of the dirt in the pan with fingers will assist in sieving. To begin, fill the grizzly with gravel and place the entire pan under water working the fine-grained material through holes in the grizzly. Now take out the grizzly and examine pebbles on the sieve. If there is nothing of value, place this waste material in a pile on the stream bank (this will be a measure of how much you can pan in an hour or a day – you will likely be surprised at how little you can pan). The material sieved by the grizzly should be sitting on the fly screen in the pan. Work the very fine material through the fly screen. Take the screen out and place in on the bank for later panning after processing the finer-grained material that slipped through the screen now sitting in the pan. Keep 1/3 to ½ of the pan under water with about a 30o tilt away from you. Wash the lighter material into the creek using circular to elliptical motion. Don’t worry about panning too hard or fast, it is difficult to lose gold as it is seven times heavier than all of that quartz, feldspar and mica. If you are looking for diamonds and other gemstones, pan easier because they are not so heavy. For example, diamond has a specific gravity of 3.52, and should end up with the black sands (magnetite, zircon, ilmenite, etc). Continue panning until all of the light minerals pan out into the stream. You should now have ‘black sands’. Search these for gold and gemstones. If the black sands have no apparent gold, start a rhythmic slapping of one edge of the pan with one hand while holding the pan with the other while you still have a little water in the pan. If you have any gold, it will separate from black sand along the edge similar to what is known as a Wilfley Table. With a 10-power geologists’ loupe, examine the gold. A common mineral mistaken for gold is mica. Mica has a low specific gravity (2.7 to 2.9). Even so, it is difficult to get out of your gold pan and will tend to stay in the pan because of its nearly two-dimensional crystal habit. It forms flat flakes that cut through water. Many prospectors have a tendency to let their imaginations run wild until they get use to seeing gold and mica. While panning, mica will tend to roll over and over in the water while gold will sit tight. Pour the water out of the pan, wet your finger with saliva and touch any gold flakes or dust and place them in a tiny vial for safe keeping. Examine the gold either with the loupe or microscope. If you have pristine gold flakes with rough and jagged edges (like corn flakes) the gold came from a nearby lode (rock found in place in bed rock), such as a classical quartz vein. Gold is very malleable and will ball up into a rounded grains or nuggets over very short transportation distances in a stream (Hausel and Hausel, 2011). Somewhere nearby Oregon Buttes at South Pass in western Wyoming is a giant treasure awaiting discovery. this gold remains unknown to this day (photo courtesy of the late J. David Love). If the gold is rugged and jagged, you should be on a treasure hunt searching upstream (or up slope) for the source. In 1988, I worked for a company in Alaska and our team found small, jagged, corn flake-like gold in a group of streams draining a large area, so we started searching and found a very large lode deposit. The deposit, now known as Donlin Creek, was described by the Northern Miner in 2012 as “…quite possibly the most important project in the world today”. Our search for gold led to the discovery of a giant deposit that now has drilled resources of about 40 million ounces, equivalent in size to the famous Homestake Mine. At today’s gold price, this is $70 billion in gold. But a couple of things to note. This treasure was discovered in 1988. It is still sitting in the ground and may not be mined until 2015 or later, 27 years after we discovered it and none of us will benefit from the mining of the gold. Why does it take so long to mine treasure after it has been found? That is a good question and there are many complex problems with developing mines. Using your geologist’s loupe, look for tiny, equal-dimensional pink, red, orange and purple mineral grains in the black sands. These may be garnets. If they are clear and larger than about 4 millimeters, they could be facetable, particularly by specialized gem cutters in Sri Lanka and India. While searching for specific kinds of garnets in Wyoming, we found a few hundred anomalies that produced garnet and other gemstones which eroded from hidden diamond pipes somewhere upstream. The source of the garnets remains unidentified and suggests that someone, someday, might find many diamond treasures in the hills of Colorado and Wyoming. Quartz from the Seminoe Mountains all containing minor specs of gold (note the circle on the sample right of the pencil). This may not look like much gold, but when you see visible gold, the sample will assay better than 1 ounce per ton! One of these samples was assayed and yielded 2.87 ounces per ton in gold! In one location, near what is known as the Miracle Mile along the North Platte River north of Sinclair, Wyoming adjacent to the Seminoe Mountains, we recovered many pyrope garnets from eroded and hidden diamond pipes as well as gold in the gravels high and dry and a few miles from the river. The gold and garnets (and likely diamonds) in this area occur in what geologists call paleoplacers (fossil stream deposits). The lode source for the gold likely eroded from gold-bearing veins at Bradley Peak to the west of the gravels. The source of the diamond indicator minerals remains unknown. In addition to possible diamonds in this area, one has to consider where did all of that paleoplacer gold come from? Did it all come from Bradley Peak in the Seminoe Mountains? Or did it come from somewhere else. Personally, I like the Seminoe Mountains. I found several nice specimens of quartz with visible gold in this area and started a gold rush in 1981 (Hausel, 1995). I also believe that one creek in this area (Deweese Creek) likely has many nuggets and gold flakes in it. When I explored this area in 1981 and mapped it later, I could find no evidence that Deweese creek had been explored. next to the nickel. It is a ruby! While looking for diamonds in the Laramie Mountains in eastern Wyoming, we recovered many tiny rubies and sapphires from our gold pans west of Wheatland and west of Iron Mountain. Ruby and sapphire have a distinct crystal habit and should be easily recognized in your gold pan. They form hexagonal prisms (6-sided prisms) or hexagonal plates (cross-sections) with three directions of parting. Parting is simply an atomic imperfection that sometimes shows up as distinct, parallel lines in many crystals. It is the same imperfection that diamond cleavers used for many years to facet large diamonds. While looking for the source of these gemstones, I found a deposit of ruby and pink sapphire at Palmer Canyon west of Wheatland. This deposit also had other gems that included thousands of carats of sky-blue kyanite and blue to purple iolite (water sapphire). Over the next few of years, I found a half-dozen ruby deposits, a giant iolite and kyanite deposit at Grizzly Creek, iolite at Ragged Top Mountain and also at Owen Creek in the Laramie Mountains and a deposit with millions of carats of kyanite. Some of the iolite at Grizzly Creek weighed many thousands of carats. One I carried in a backpack weighed more than 24,000 carats – the largest ever recorded. But much, much larger iolite gems were left in the outcrop! Gem-quality garnets found in Wyoming by the author. in this region weighed 28.3 carats. Vein (lode) deposit seen in back (roof) of mine in California. The geology of the area (Colorado-Wyoming State Line district) indicates hundreds of thousands of tons of diamond-bearing kimberlite eroded in the past. This material with its hundreds of thousands of diamonds was carried downstream in creeks and rivers south of the state line. Yet, it is extremely rare for anyone to report finding diamonds in the creeks. I suspect it is because of the lack of historic gold prospecting in the area, but someday, someone will find a rich cache of diamonds and start a rush. One prospector from Fort Collins use to find diamonds in Rabbit Creek while searching for gold, but he was possibly the only one who ever searched for gold and diamonds in the creeks of the area. Diamonds are easy to recognize once a person gets use to their appearance. They look greasy and are often equal dimensional forming what is known as a octahedron (8-sided crystal) or a modification of an octahedron. Gold nuggets are a great treasure. Many are worth more than the price of gold and most have eroded from nearby lodes. The earliest reported discovery of gold in the US was in North Carolina. Nuggets were found along Little Meadow Creek including a 247.6 troy ounce nugget discovered in 1799. More than 1.2 million troy ounces of gold were produced from North Carolina over the years. Little Meadow Creek produced so many nuggets that it was called ‘the potato patch’ in reference to large nuggets. Not long after the North Carolina discoveries, gold was found in Georgia. A gold rush in Dahlonega in 1829 resulted in as many as 500 gold placers and lode mines. Many nuggets were recovered including those of 54, 42, 40, 35, 26, 25, 19, 18, 15, 11, 6, 5, 4, 3 and 2 troy ounces. These were found in Gilmer, Habersham, White, Cherokee and Lumpkin Counties. the largest is about one troy ounce. Alaska has been a good source for nuggets. The largest was discovered in 1998 in Swift Creek near Ruby in central Alaska. The softball-size nugget, known as the Centennial nugget, weighed 294.1 troy ounces. Another large nugget found on Long Creek near Ruby weighed 46 ounces. Large nuggets were also found on Anvil Creek near Nome in western Alaska that included nuggets of 182, 107, 97, 95 and 84 troy ounces. In northern Alaska, nuggets of 146, 137, 61, and 55 troy ounces were found in the Hammond River within the Brooks Range near Wiseman. In the same region, a 42-ounce nugget was found in Nolan Creek in 1994. 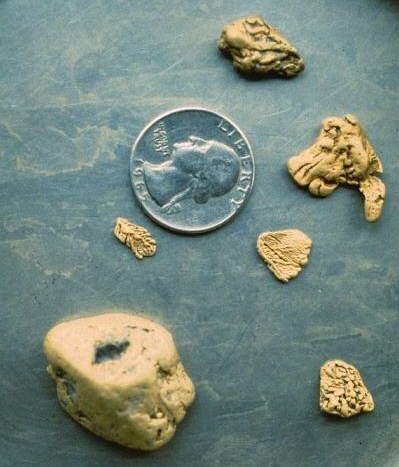 The Gaines Nugget (122 troy ounces) was found in the Kuskokwim of southwestern Alaska near McGrath. Another nugget, known as the Chicken Nugget, was found in Wade Creek near Chicken in eastern Alaska in 1983. This weighed 56.75 ounces. A nugget of 56 ounces was found on Dome Creek near Tolovana in central Alaska and a 52-ounce nugget was found on Lucky Gulch (Valdez Creek) near Denali in central Alaska. 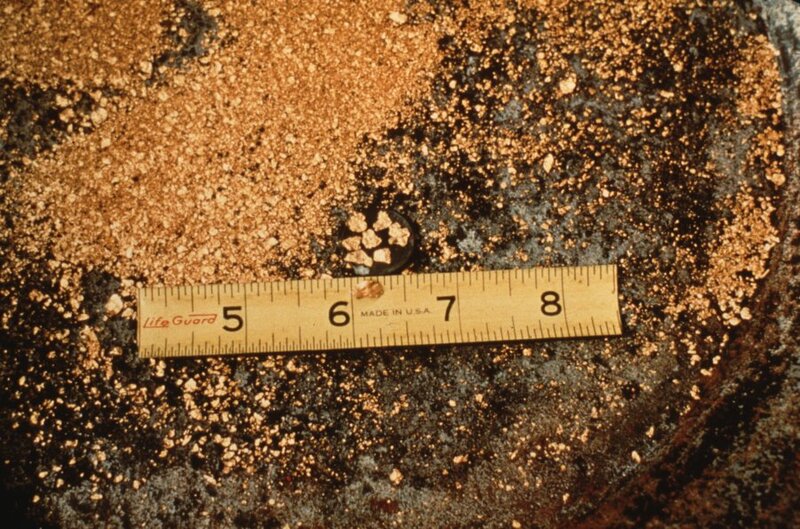 Arizona has produced many gold nuggets, but these are small compared to Alaska and California. 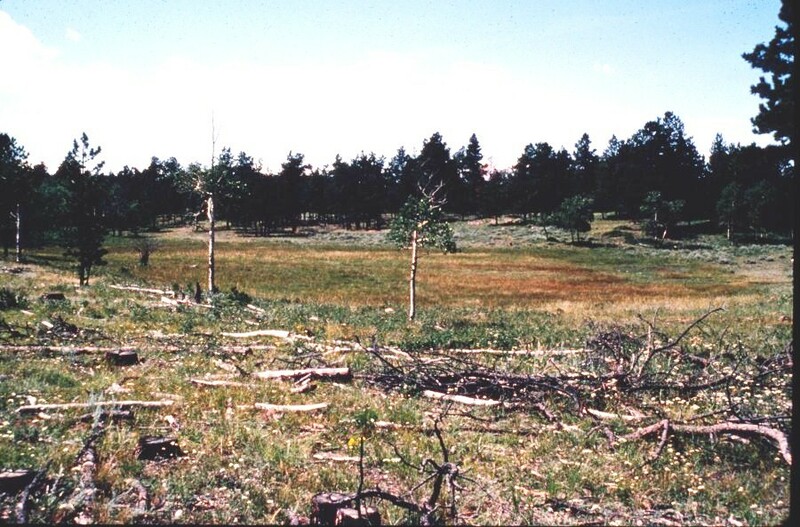 This is likely due to the lack of active streams although many are found in alluvium and fanglomerates along the sides of hills. A few of the better known places for nuggets in Arizona include the Potato Patch at Rich Hill in the Weaver Mountains and the Greaterville placers south of Tucson in the Santa Rita Mountains. Several nuggets were discovered in the Greaterville placers including one that weighed 37 ounces. Some of the nuggets in this district are reported to have had galena attached to the precious metal. Galena is a very soft, lead-sulfide mineral with perfect cleavage and will break down over a very short transportation distance. This along with angular blocks of rhyolite and granite in the placers supports that the Greaterville nuggets have a proximal source and likely eroded from nearby silver and galena-rich quartz veins. In the Weaver Mountains, samples of quartz with visible gold are often found with nuggets. Gold in the nearby Bradshaw Mountains has been found in Lynx Creek, French Creek, Big Bug Creek, and the upper Hassayampa River. Based on the geology and location of gold nuggets found in Arizona, several gold deposits have likely been overlooked. Large nuggets were mined in Montana at Alder Gulch and California Gulch near Phillipsburg in the southwestern portion of the state. In 1902, a football-size nugget of 612.5 troy ounces was recovered from California Gulch. This was followed by discovery of a 77 troy ounce nugget from the same gulch. The largest nugget found in Colorado weighed 160 troy ounces and was named Toms’ Baby found in 1887 on Farncomb Hill at the head of the French Gulch placer near Breckenridge. The largest nuggets found in the US were from California. At Carson Hill in Calaveras County, a nugget weighing 2,340 troy ounces was recovered in 1854. Another water worn nugget of 648 troy ounces was found at Magalia, California in 1859. Both of these were too large to have transported any distance. The largest nugget from Wyoming weighed 34 ounces. There was an very interesting reference to a boulder in Rock Creek at South Pass that contained an estimated 630 ounces of gold. If so, this nugget with attached quartz was likely the size of a football. Many nuggets were also recovered from Carissa Gulch. So as you are looking for gold and other treasures with a gold pan, keep in mind how valuable gemstones can be. Gold is very valuable, but some pink and red diamonds have sold for as much as $1 million per carat. A carat is tiny compared to an ounce of gold and some of these diamonds have sold for many thousands of times the value of an equivalent weight in gold. Erlich, E.I., and Hausel, W.D., 2002, Diamond Deposits – Origin, Exploration, and History of Discoveries: Society of Mining Engineers, 374 p.
Hausel, W.D., 1994, Economic geology of the Seminoe Mountains greenstone belt, Carbon County, Wyoming: Geological Survey of Wyoming Report of investigations 50, 31 p.
Hausel, W.D., 1996, Pacific Coast diamonds-an unconventional source terrane in Coyner, A.R., and Fahey, P.L., eds., Geology and ore deposits of the American Cordillera, Geological Society of Nevada Symposium Proceedings, Reno/Sparks, Nevada, p. 925-934. Hausel, W.D., 1998, Diamonds and mantle source rocks in the Wyoming Craton, with a discussion of other US occurrences: Wyoming State Geological Survey Report of Investigations 53, 93 p.
Hausel, W.D., 2001, Placer and Lode Gold Deposits: International California Mining Journal, v. 71, no. 2, p. 7-34. 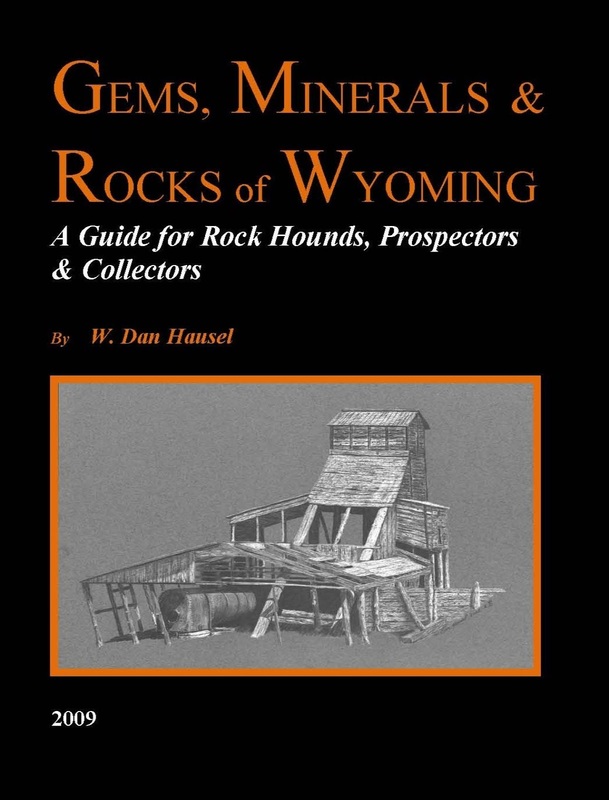 Hausel, W.D., 2006, Minerals & Rocks of Wyoming, A Guide for Collectors, Prospectors and Rock Hounds, WSGS Bulletin 72, 125 p.
Hausel, W.D., 2009, Gems, Minerals and Rocks of Wyoming. 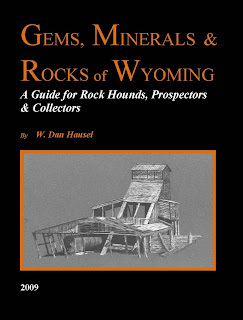 A Guide for Rock Hounds, Prospectors & Collectors. Booksurge, 175 p.
Hausel, W.D., and Hausel, E.J., 2011, GOLD - Field Guide for Prospectors and Geologists - Wyoming Examples. 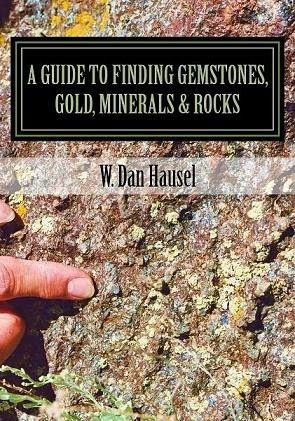 CreateSpace, 366 p.
Hausel, W.D., 2014, A Guide to Finding Gemstones, Gold, Minerals and Rocks: GemHunter Books, 369 p.
What great information. I have been doing research on diamond appreciation that's when I came across your post. Thanks so much for all this interesting information about mining. I think I may actually put it on my bucket list to try to mine for gold. Thanks so much! Is it possible to refine gold to a 100% purity?